The temperature has at last climbed into summer. The heat of the days welcome the crepe myrtle trees, suddenly fat with blossoms - white, pink, purple - hiding the last open spaces of winter, the spaces spring's watercolors couldn't cover. The red dragonflies return, also the orange daylilies, and the sweet willingness to do absolutely nothing settles over us, summer laziness relaxing bones and minds and hearts. 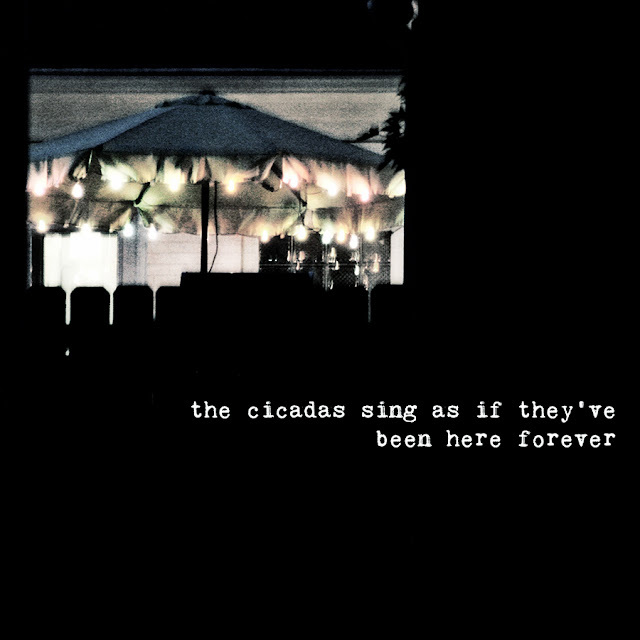 The evenings overflow with muggy breezes and mosquitoes, and summer nights bring the cicadas' songs. The cat winds her way to the third floor balcony, summer sprawling dark and hot around the house, sliding up the stairs with her. I read to avoid thinking about things. All fiction and kisses and mexican hot chocolate. once upon a time there was the way the sun fell through my mother's windows, puddling on the back of the couch of my young childhood. i would sit backwards, books settled into that light, and get lost in their stories. i still see the little ballerina in my memories, pink and white tutus glowing across the big pages, dust motes dancing - summer memories if the color of the remembered light is to be believed. late afternoon. i read to avoid thinking about things. yes. words are always saving us. summer is not my favourite time. it's my least favourite time. but I come here and I know I'm going to find a gentle invitation to try and see another way. your words help me heal.